The existing iOS platform is lacking ofsystematic assessment methods of privacy leak detection.To solve this problem,a multi-dimensional iOSprivacy disclosure evaluation model was presented.This model combined static analysis,dynamic analysis and network data analysis method to extract the features of the application’s pri-vacy disclosure behavior and evaluate it form multiple dimensions way.The model on 30 different types of apps from the iOS App Store and found out that more than 50% of all investigated apps aretracking users’ locations were evaluated,almost 40% of all send data to a server without the user’s consent.The model makes up for the limitations of single static analysis or dynamic analysis methods,solves the quantization problem of privacy disclosure effectively. Yue-xiu XING,Ai-qun HU,Yong-jian WANG,Ran ZHAO. Research on multi-dimensional iOS privacy disclosure evaluation model[J]. Chinese Journal of Netword and Information Security, 2016, 2(4): 73-79. Smartphone OS market share,2015 Q2[EB/OL]. .
 EGELE M , KRUEGEL C , KIRDA E , et al . 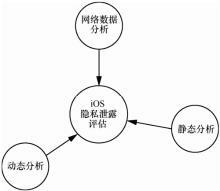 PiOS:detecting privacy leaks in iOS applications[C]// NDSS.c 2011:289-291. GILBERT P , CHUN B G , LANDON P , et al . Automating privacy testing of smartphone applications:technical report:CS-2011-02[R]. Duke University, 2011. KURTZ A , WEINLEIN A , SETTGAST C , et al . 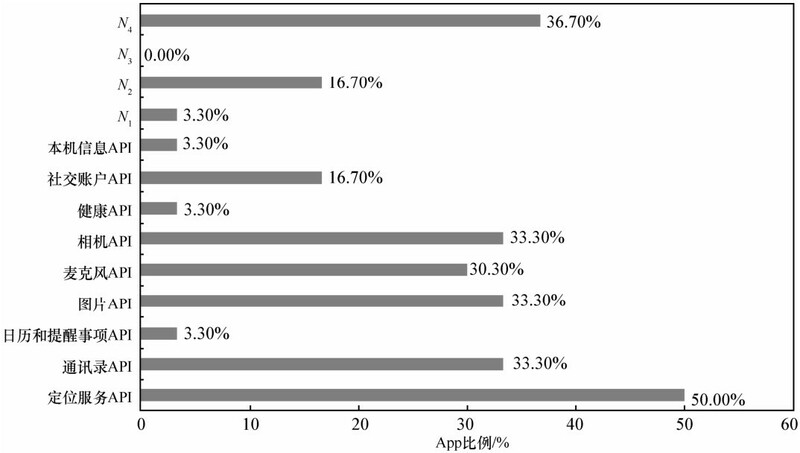 DiOS:dynamic privacy analysis of iOS applications:friedrich-alexander-universit?t erlangen-nürnberg,dept of computer science,CS-2014-03[R]. 2014. PENG L , CUI B J . A comparative study on software vulnerability static analysis techniques and tools[C]// Information Theory and In-formation Security.c 2010:521-524. EPIFANI M , PASQUALE S . Learning iOS Forensics[M]// Bir-mingham:Packt Publishing Ltd, 2015:153-170. NYGARD S . Class-dump[EB/OL] Managerial Finance, . AGARWAL Y , HALL M . Protect my privacy:detecting and miti-gating privacy leaks on iOS devices using crowdsourcing[C]// The Intemational Conference on Mobile Systems,Application,and Ser-vices.c 2013:97-110. FREEMAN J . 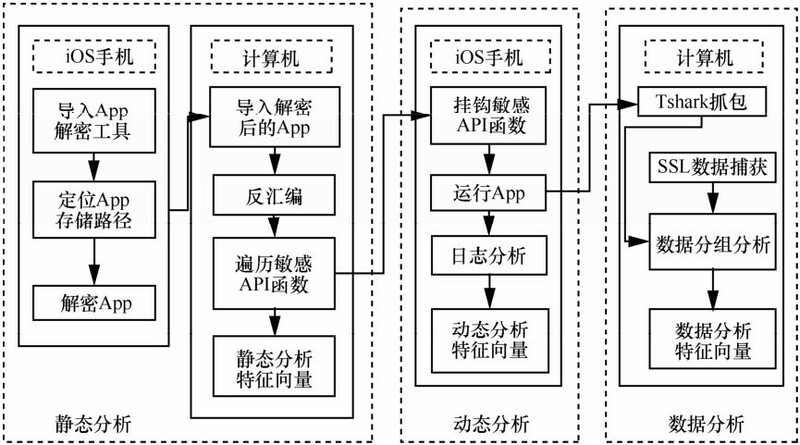 Mobile substrate[EB/OL]. .
 张兴兰,崔遥. 基于群签名的属性加密方案[J]. 网络与信息安全学报, 2019, 5(1): 15-21. 李晴,叶阿勇,姚志强,陈爱民. 基于AP指纹的RAP检测方法[J]. 网络与信息安全学报, 2018, 4(5): 55-61. 何欣,桂小林. 基于概率感知覆盖的无线传感器网络节点优化部署方案[J]. 通信学报, 2010, 31(9A): 1 -8 . 陆奕奕. 破坏性创新：云计算产品的市场定位与推进策略[J]. 电信科学, 2012, 28(3): 116 -121 . 黄 飞,许 辉,吴诗其. 低轨卫星通信中基于公平性的信道借用策略[J]. 通信学报, 2006, 27(8): 2 -17 . 陶建喜1,3,4，周立2，周舟1,4，杨威1,4，刘庆云1,4，杨嵘1,4. 非对称路由环境下SYN flood攻击防御方法[J]. 通信学报, 2013, 34(Z1): 38 -291 . 唐 洪,邱天爽,张文蓉. 脉冲噪声环境中自适应阵列对信号的跟踪[J]. 通信学报, 2005, 26(8): 4 -27 . 刘景伟,孙 蓉,马文平. 高效的基于ID的无证书签名方案[J]. 通信学报, 2008, 29(2): 13 -94 . 孙美凤,龚 俭,杨 望. 基于特征的入侵检测系统的评估新方法[J]. 通信学报, 2007, 28(11): 2 -14 . 王亚飞,张睿哲. 强安全无对的无证书签名方案[J]. 通信学报, 2013, 34(2): 11 -99 . 李慧贤,庞辽军. 基于双线性变换的可证明安全的秘密共享方案[J]. 通信学报, 2008, 29(10): 7 -50 .